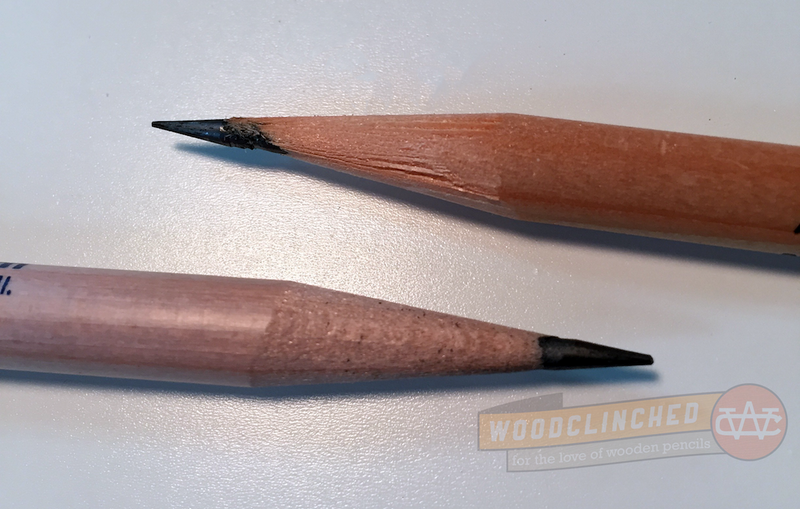 It’s been a minute since I’ve written anything about Palomino Blackwing/Pencils.com/CalCedar. But it’s not for want of any new products from them. They’ve been busy! Their latest release is a great follow-up to my post in Summer 2014 about the Blackwing Slate, a Blackwing-branded A5-sized journal. Since that release, they haven’t said much about their line of paper products, though I’ve seen the Slate in most stores that carry their pencils. I figured they’ve been concentrating on their (very ambitious) quarterly Volumes releases. But it was in the last Volumes release that they gave us a taste of what’s to come. The Volume 205 edition (the “jade” edition) included an extra. A small, single, pocket-sized notebook with the same leather-ish polyurethane black cover as the Slate. Later on, they announced it was called the Blackwing Clutch. And they followed that up with the Summit, a larger, 8.5 x 10” edition. Like the Slate, the Clutch and the Summit are plain black with a creamy, thick paper. Unlike the Slate, they are perfect-bound with a contiguous cover from front to back, similar to a Write Notepad notebook. And they have a soft cover; similar to a Moleskine, though with a better, thicker cover. One thing about both of these new notebooks was bugging me — the name. The “Slate” makes sense — it’s another name for a handheld writing surface. But what about the “Clutch” and the “Summit”? I’m a fan of the matte black covers — they match my iPhone really well, so when my notebook and phone are laying on a desk next to each other, it looks like I planned it that way. That said, I’m generally drawn to stationery items with a bit of color. The Baron Fig Three-Legged Juggler and the Write Notepads Kindred Spirit are two notebooks that come to mind. But these are subtle and classic, and complement their pencils really nicely. Blackwing pencils are themselves not subtle (though I do think most of them are pretty classic), so unlike a bright pocket notebook (Say, the Field Notes Unexposed edition), these notebooks won’t draw attention away from them. That’s not a particularly unique value proposition — you can do that with any saddle-stitched or perfect-bound pocket notebook. And really, anything that’s graph or dot-grid ruled. Also, the notebook isn’t particular good at being used sideways like that — the binding is very tight and it’s hard to break the spine on some pages. The Summit makes no such claims. The binding is a bit different — it’s more of a traditional journal, with the cover material tucked underneath the end sheet. And that’s not even the softest Blackwing out there. Despite the smeariness, I like it a lot. It feels like paper befitting a luxury brand. I am, however, not a huge fan of the dot grid here. It’s well-spaced — just about the same as the Baron Fig Confidant. But the dots themselves are big and bold, which makes them feel a bit intrusive. I would much prefer them to be smaller and lighter. Both the Clutch and the Summit come in dot grid, lined and blank (the latter two I haven’t tried). This is where you really see what “luxury brand” means. Like their pencil counterparts, this is not cheap. A three-pack of the Clutch notebooks are $14.95. The Summit is just a dollar cheaper than the Slate, at $21.95. This is something you’ll have to determine for yourself. For me? It’s worth the quality they put into the notebook. They seem way more sturdy than the $12-per-pack Field Notes (only time will tell, though). However great the quality is, I still would prefer a bit of color in my notebook. The Baron Fig Confidant and Vanguard limited editions are great for me in that regard, as are Write Notepads’ pocket notebooks. The Blackwing notebooks don’t appeal to me, aesthetically, as much as they do. If you like a subtle, classic black, I wholeheartedly recommend them. I will certainly keep coming back to Blackwing for pencils, though. My Volumes subscription renews in a week, and that’ll be the start of my third year as a subscriber. Check out the Blackwing Clutch at Blackwing602.com. And the Blackwing Summit. And if you haven’t seen it before, the Blackwing Slate is the hardcover journal sized right in the middle. And thanks to Blackwing for providing me a pack of the Clutches and Summits at no charge for review purposes. I don’t know if it’s because of my ten years of Catholic school — or perhaps in spite of it — but the colorful, patterned cloth has appealed to me for as long as I can remember. Perhaps none have been present in my wardrobe more than Black Watch plaid — a simple, understated green and blue plaid with roots in Scottish military garb born out of the unsuccessful Jacobite rebellion in the early eighteenth century. I had a Pendleton wool scarf, which I cherished, and, in my late teens and early 20s, even a wool sweater vest! Thats why, when I first became aware of Waverley’s tartan cloth-bound collection of journals from my friend Gary Varner’s blog, I was instantly lovestruck. That’s what Heather Rivard, co-host of the Art Supply Posse Podcast, said as to why she loved school supply shopping when she was a kid. She verbalized perfectly how I feel about it. I think the biggest difference is that I wore a uniform at Catholic school, so mostly it was “dress-down day” that caused my anxiety. Sometimes, I remember, I wore my uniform anyway and just said that I forgot to wear street clothes. At the risk of psychoanalyzing myself, this could very well be the reason I fell in love with stationery in the first place. My post about Yikes! 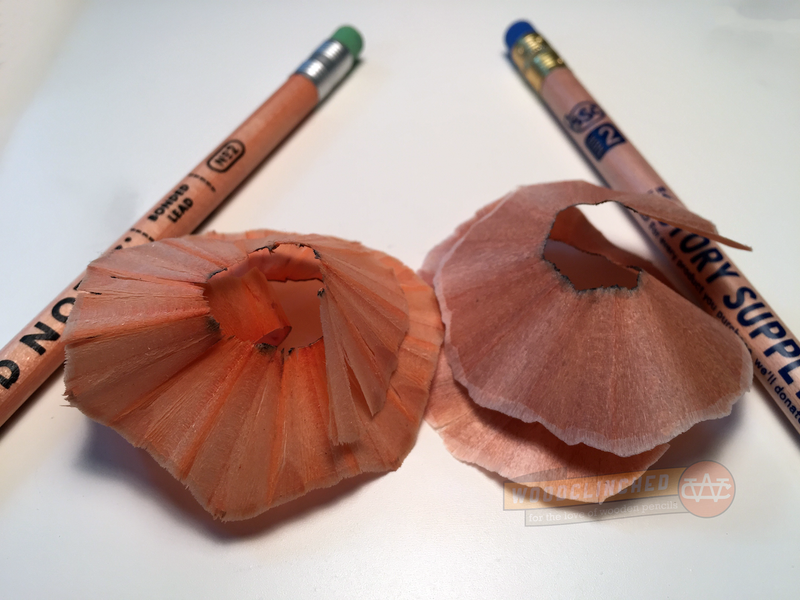 pencils is by far the most popular post on this blog, so I know we’re not alone. I love Art Supply Posse! Heather, and my friend and long-time stationery blogger Ana Reinert from The Well-Appointed Desk, host it together, and although they go WAY deeper into art supplies than I can follow, they’re such interesting people. 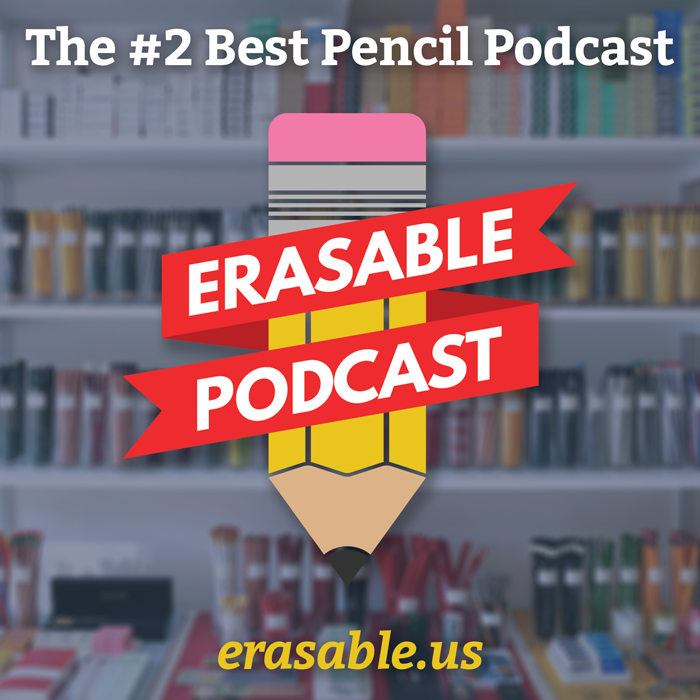 And it’s nice to see a niche of the stationery world get a well-deserved podcast. Have I mentioned lately how much I love the Erasable community? Well, a lot, I’m sure. But this is something special. 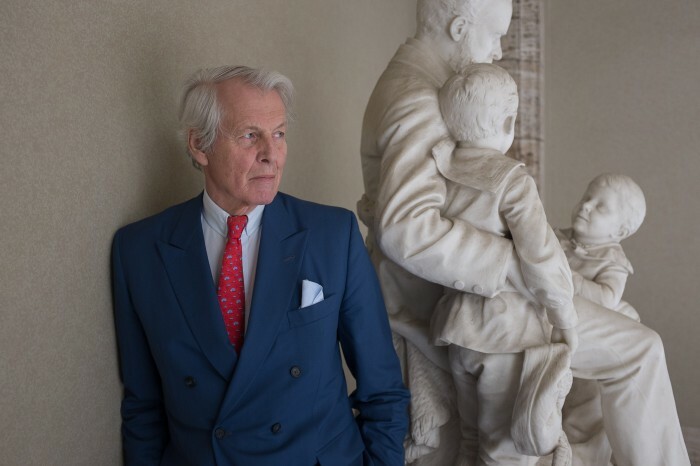 One of our group members, Vito Grippi, recently launched a (successful!) Kickstarter campaign for his new company, Story Supply Co. In a nutshell, they source and give away “story supply kits,” for kids to learn the art of creative writing, storytelling and journaling. They’re partnering with 826, a series of fantastic arts nonprofits that help kids with many of the same goals. Did you notice the cameos from a Mitsubishi Hi Uni and a couple Palomino Blackwings? I sure did. This is the kind of thing I love — admittedly a pocket notebook and a pencil aren’t the most original offerings ever, but they’re tools for creation! It’s not about creating specialized notebooks with one purpose and one layout. It’s about making a good quality notebook, a good quality writing utensil, for a great cause — helping give kids the same opportunity. I also love that they’re partnering with 826. I have a couple posters from 826LA, and I’m not too far from the original, 826 Valencia, which is in the Mission district of San Francisco. Full disclosure: I pledged already, and Vito sent me a pack of notebooks and a pencil early for review purposes. So while I haven’t really paid for them, I am already a backer of this campaign. I’m a bit late to this review (Johnny talked about it over on the venerable Pencil Revolution, and Gary Varner’s very active new upstart paper blog Papernery has a great review,) but I will mention a few things. 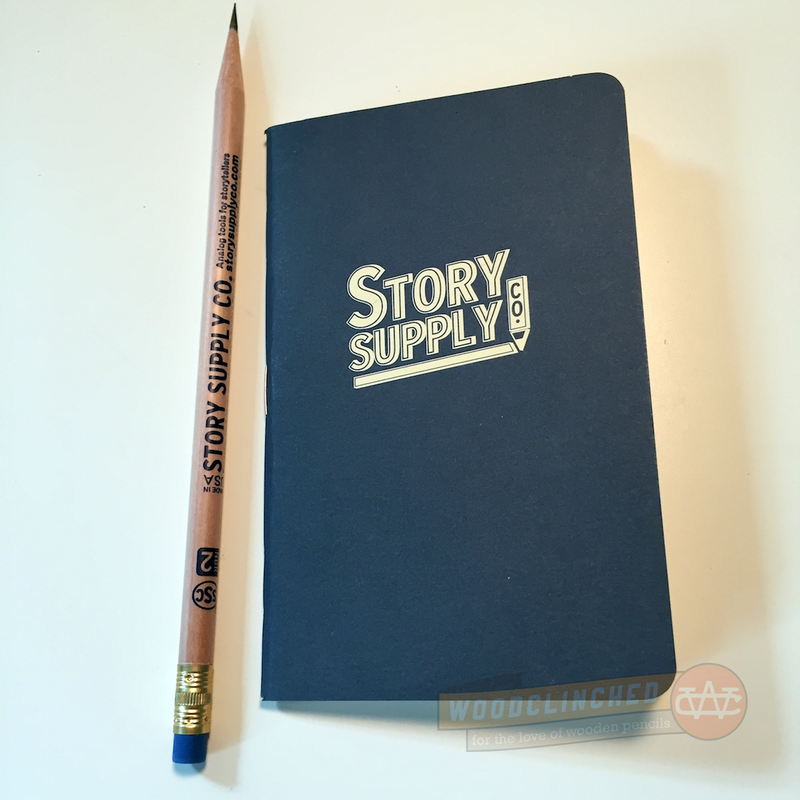 I’m definitely loving the simple, navy blue cover with the Story Supply Co. logo on the front. It’s clean, and the navy-over-cream cover stock seems thick and rugged. The cover has a bit of tooth, as I noticed that there’s a subtle fiber interwoven in the paper, sort of like a dollar bill. I’ll mention that the cover itself is pretty bad at closing completely once opened, and when it’s open, it wants to fold up pretty bad. It’s not dissimilar from Scout Books in that regard, though I know for sure that this is not a Scout Books product. 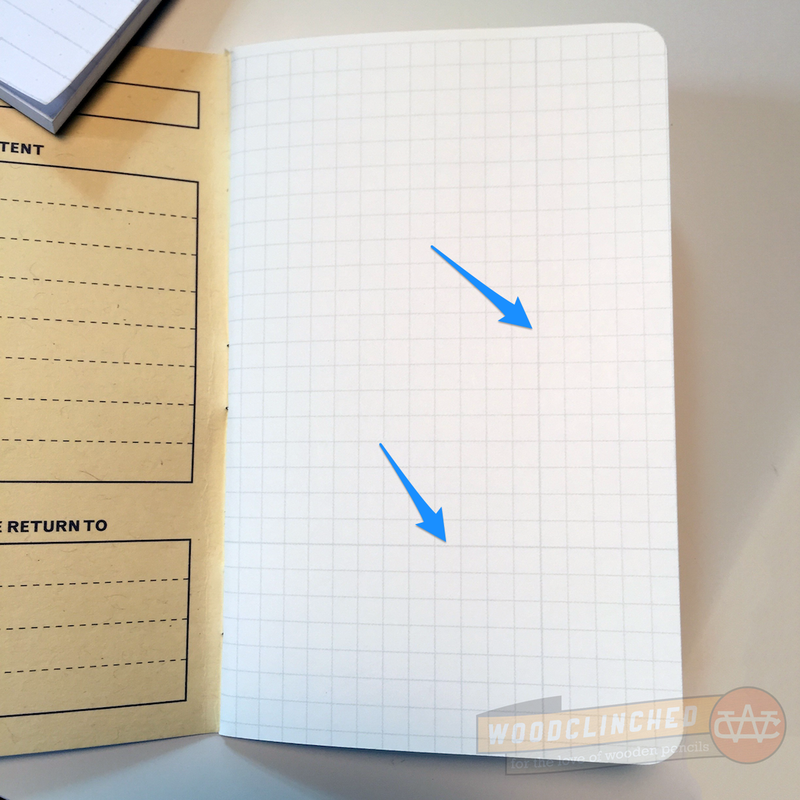 The inside is a creamy, thick graph paper. According to Gary, it’s a luxurious 70# weight, which is more than enough for the darkest of pencils, and perfect for all but perhaps the thirstiest of fountain pens. The 5 millimeter grid is a great size, though it’s laid out strangely on the page. It doesn’t quite meet the top of the paper, though there isn’t enough space for a non-gridded headline, and there’s a slightly thicker line running a quarter of the way in from the outside of the page, and a quarter of the way up. See? Maybe that was intentional? I have no idea. Still, though. It’s a bit rough around the edges, but it’s a damn fine notebook, especially considering it was their first run. As the company matures, I’m sure it’ll get better and better. Now, this is an interesting one. Vito was kind enough to include one of their later offerings, a round, natural-finish pencil! It bears the name, tagline, and some other information about the company, and on top of a golden ferrule, it has a navy blue eraser that matches the silkscreen on the barrel! Swoon. While it physically resembles the Field Notes pencil, I’m convinced it’s better quality. The wood isn’t as splintery when I sharpened it (with my KUM Masterpiece!) and while the pencil itself isn’t as fragrant as the Field Notes pencil, the shavings are more so. I’m not sure why that is, but I’m guessing that there’s an ever-so-thin layer of clear lacquer or sealant over the Story Supply Co. pencil. It’s thin enough to leave you feeling like you’re gripping a natural-finish pencil, but it’s not splintery at all, like I find the Field Notes pencil to be. They leave very similar marks, but the Story Supply Co. pencil is noticeably smoother to write with than the scratchy Field Notes pencil. 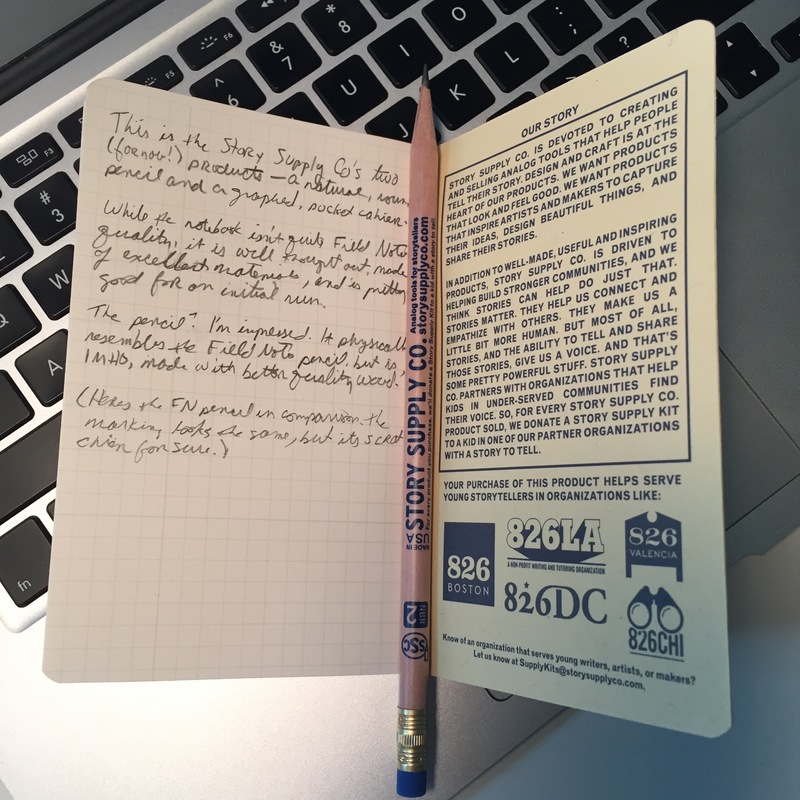 In fact, the only things I think the Field Notes pencil has over this one is a) the typography is better (because, duh, Aaron Draplin) and the ferrule is more unique. Though maybe not as effective — a lot of people have told me the eraser comes out easily. 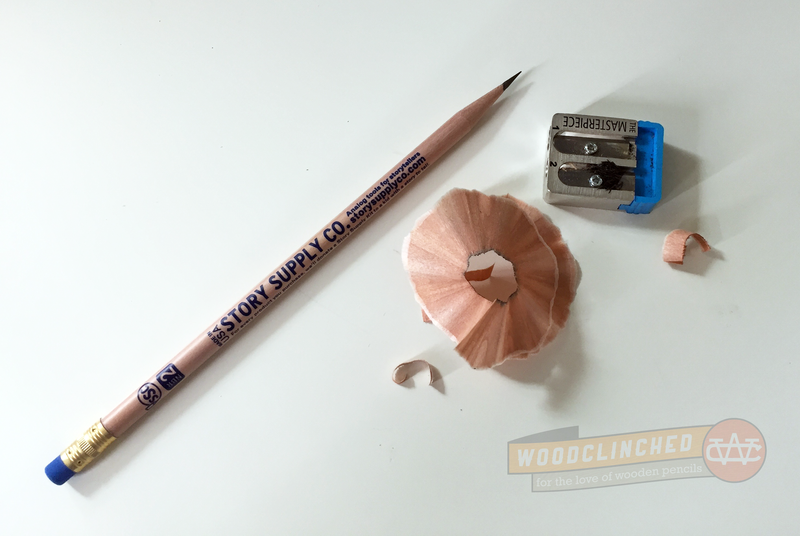 Story Supply Co.’s ferrule isn’t particularly special but it seems to do it’s job, which is what it’s all about, right? The Story Supply Co. Kickstarter campaign successfully reached its $5,000 goal four days after launching, which is impressive and commendable. At the time of this writing, it’s at $7,167, which seems like it’s still got a lot of momentum in it. I can’t wait to see Vito’s stretch goals! This is the way to do it, folks. I’m loving Vito’s vision for the company, and his Kickstarter prowess. Check out more about Story Supply Co. at their website, or go straight to their Kickstarter page. One of the advantages to working for a large company with offices in multiple cities is that one has an easy way to communicate with people in those cities, and an automatic ice breaker with them. The count pushed his chair back slightly. We were sitting on wooden chairs with peanut-brown cushions decorated with the outline of flowers. I love this description of the Count, his generations-old company, and his bemused, poetical waxings about pencils. In my head, his voice sounds like Bane from The Dark Knight Rises, but with a German accent. Go check it out. It’s a great read.